OZAMIZ CITY, Misamis Occidental - It was our second and last day in Ozamiz City and we didn't let this day pass without visiting the Birhen sa Cotta Shrine, especially that the feast of Nuestra Señora de la Inmaculada Concepción y del Triunfo de la Cruz de Migpangi (Our Lady of Triumph) will be celebrated the following day. 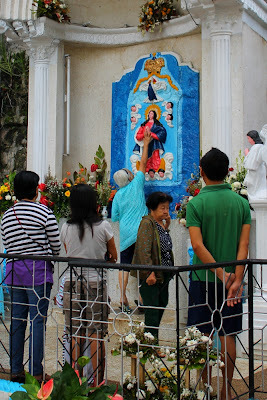 The shrine is one of the most significant pilgrimage sites in Mindanao, dedicated to the 18th century statuette of the Blessed Virgin Mary carved on the exterior wall of Cotta Fort. The image is believed to be miraculous, standing to guard the entrance of the city from Panguil Bay. We lighted candles and offered prayers and were moved by the devotion of the people of Ozamiz to their beloved Birhen sa Cotta, as the Catholic faithful venerate and touch the miraculous image of Mary vested in pink and blue.